Where Do I began? My mind is racing, so I will back up to the 22nd of January. Hey… We received George’s paperwork. Come on you must know how excited we are.. Can you picture me dancing? LOL Bryce has been Looking at the weather windows. I’ve been listing to the chatter. Nobody is leaving but us. Bryce found us a window for our crossing. It was a perfect 15 mph south wind to get us to the Bahamas Bank. Crossing to Bimini was not good because of the expected heavy winds in northern Bahamas. 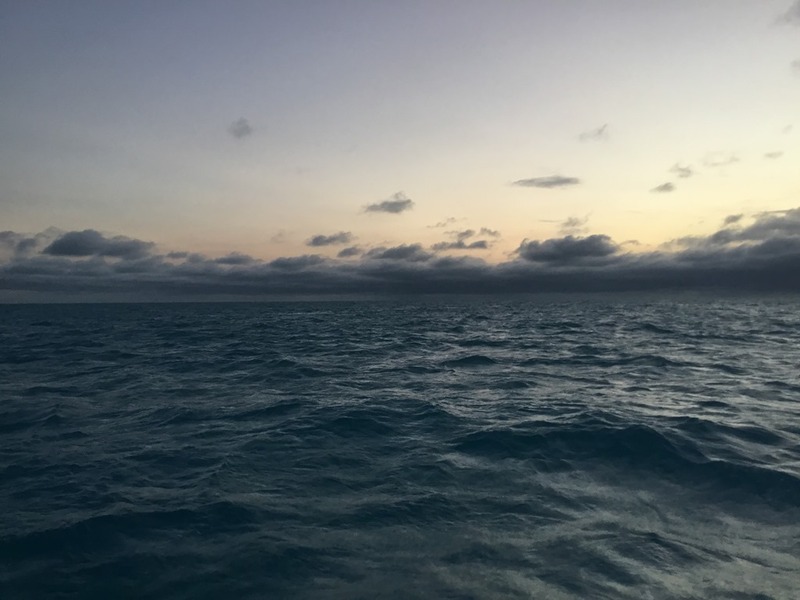 In the southern Bahamas, a 5 day crossing to George Town provided weather window that was about as good as it was ever going to get. The southern route was also appealing because it always keep us in shallow water. For years, we wanted to explore the western side of Andros. 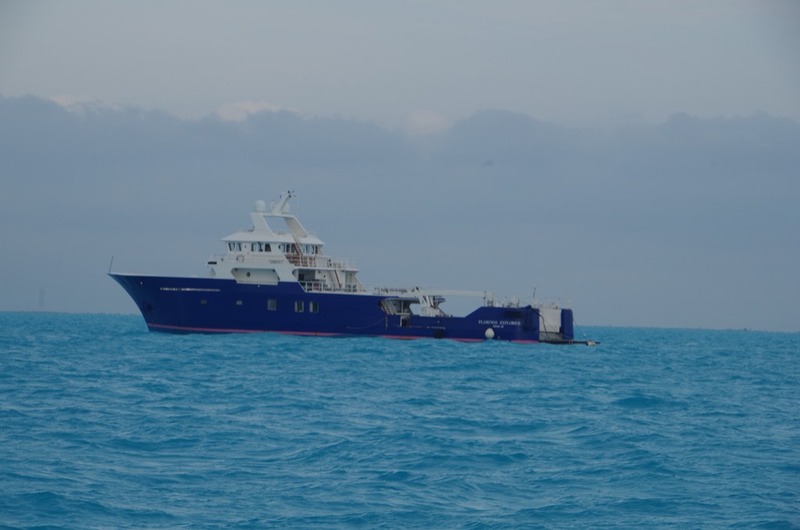 We have already gone the northern route through Bimini, so we wanted to do something different. Our actual way-pointed route is shown below. The long jut from southern Andros comes from a tack due to winds on our nose and the shoaling near the southern tip. We actually sailed through the reefs at the bottom of Andros, below the tongue of the ocean, as there is a nice channel through. We are tied to a mooring ball in Boot Key harbor Marathon. We have a lot to get done. Bryce filled up all the tanks, you know water, diesel, gas. We have had strong winds gusting so bad that on Wednesday night around midnight we flew out of bed. Something bad happened, we could hear it hit the jet ski as she fell from the sky and sank in the dark waters; to be forever gone. Tears ran down my cheeks as I looked over at Bryce shaking his head.. “ I knew this was going to happen.. Why didn’t I use a stronger pipe?” he mumbled. I replied Crap happens!! It was a cheap wind turbine that Bryce wanted to test. We can order a new one, I guess you might be wondering what I am babbling about? We said goodbye to our new wind generator Her name would have been Milly for windmill.. LOL You all know how I like giving thing names. As we pictured her sinking to the bottom of Boot Key Harbor. We tried to get a few more hours of sleep but come on you know when something like this happens neither one of us slept well. 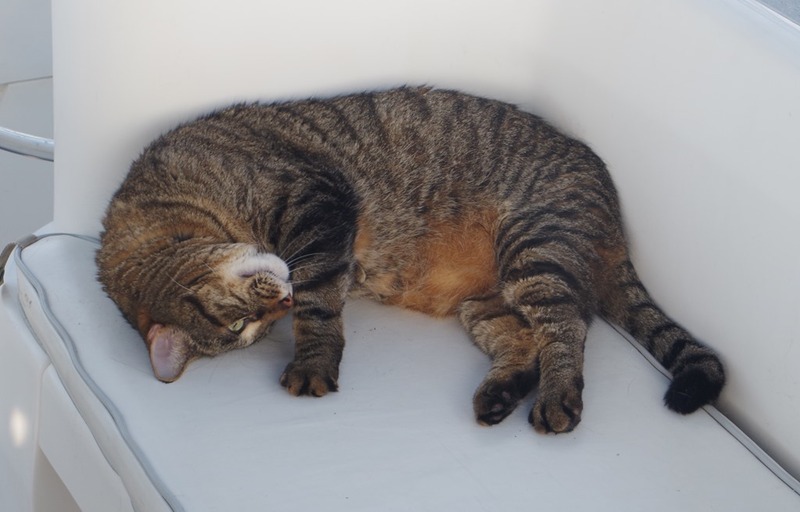 RIP Milly…. Sunrise came about 6:30 a.m. We did call OCD to see if they would come dive for it but the water was to stirred up with all the strong winds They wouldn’t chance it. Okay, now life goes on right? Thursday still looks like the perfect window for us. However we would not be able to go to Bimini due to the weather in northern Bahamas. 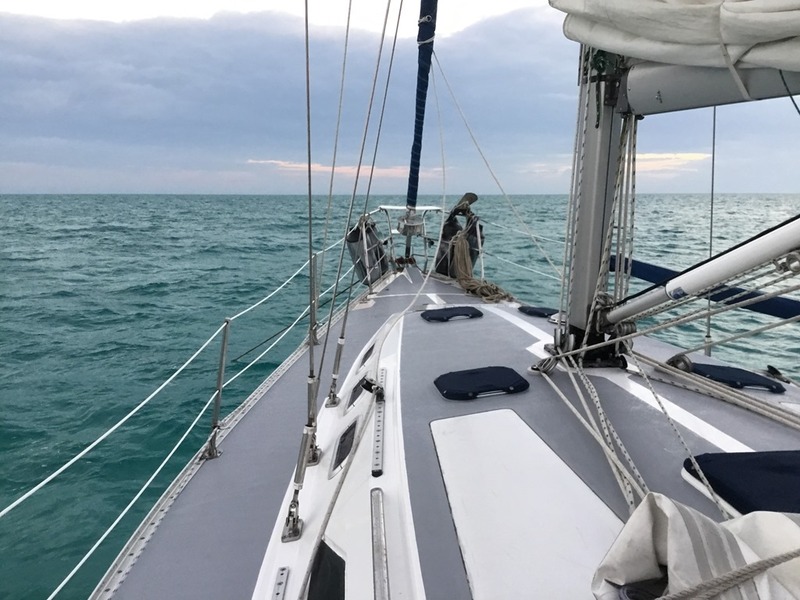 We have decided to sail the South side of Andros Bahamas. But in the mean time, we still had to get groceries and laundry done. Let me not forget George has to go to the vet too. All of this has to get done. 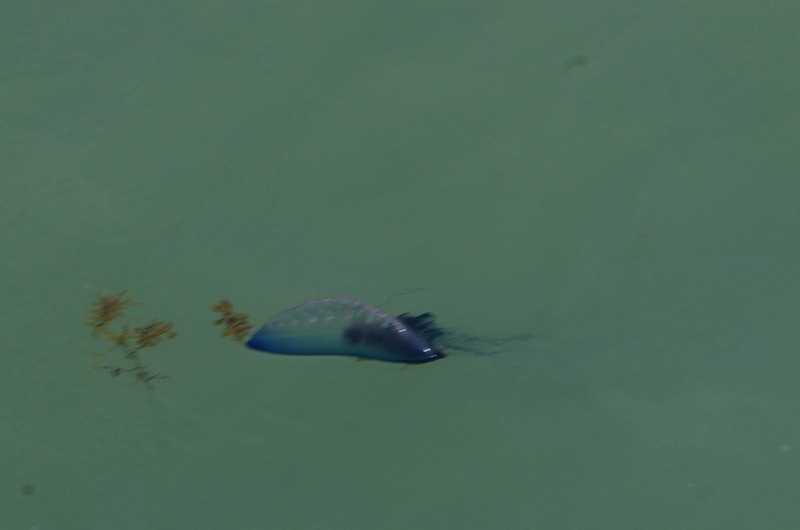 One of the first things I noticed floating on the ocean were Man-of-war’s. Always see a lot of these guys new Marathon. George is fully recuperated from his visit to the vet. Night 1: As dusk approaches, we continued our crossing to the Bahamas. It was a very good crossing for the most part. We had 15 knot southerly beam winds that zipped us through the 24 hour crossing. We averaged about 8 mph and Beauty peaked at 10.5 mph as she flew across the Gulf Stream. Nearing 3 a.m. we started seeing lightning thinking it was probably heat lighting. We didn’t think much of it. About an hour later the heat lighting turned into multiple thunder storms. It rained, but not too long. 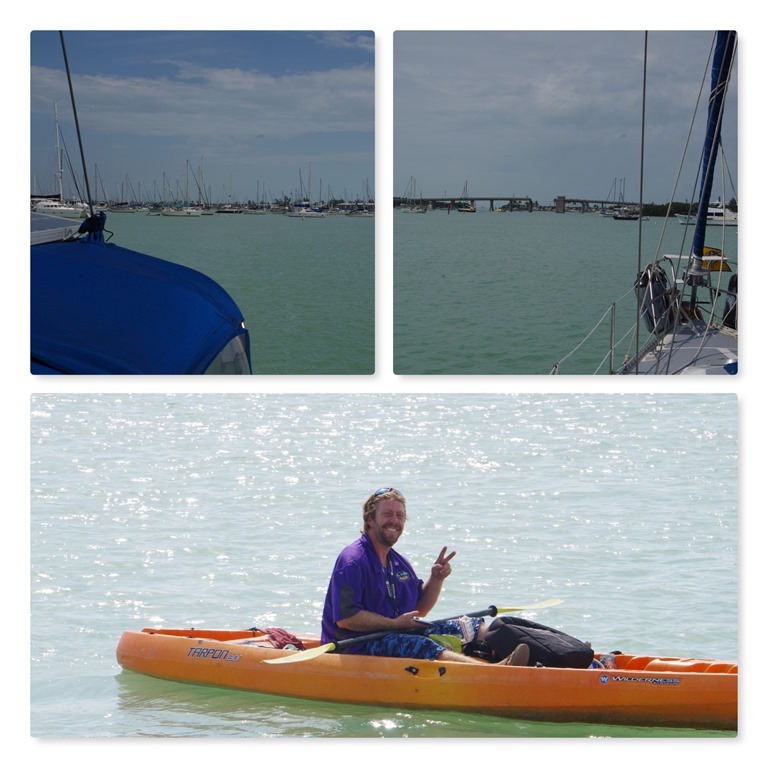 After about 130 miles, we were in the calm shallows of the Bahama Banks. Just after we got to the Bahama Banks, the winds shifted 180 degrees to a northerly beam wind. This was the reason we felt a Bimini run would not be good. However, these moderate northers over the next few days would propel us down the western shore of Andros. Northern Bahamas was seeing much higher Northers. The second day was sunny and warm as we scooted across the banks to our first anchorage. Night 2 after crossing the Atlantic Ocean. We anchored in South Andros just North of Goose River in the Bahamas. We had 8 feet at low tide of water. Charted depth is 6 feet. Water temp is 75 degrees. We were shocked to see we were not alone! We anchored near this vessel named: Flamingo Explorer. She is a 150 ft long and drafts 10 feet. She was anchored closer to shore than us! They reached out to us and invited us over for coffee in the morning, but we slept in. We thought perhaps we might reach the BTC cell towers on the east side of Andros, but no go. Night 3 Well another great day to sail with 20 knot winds. 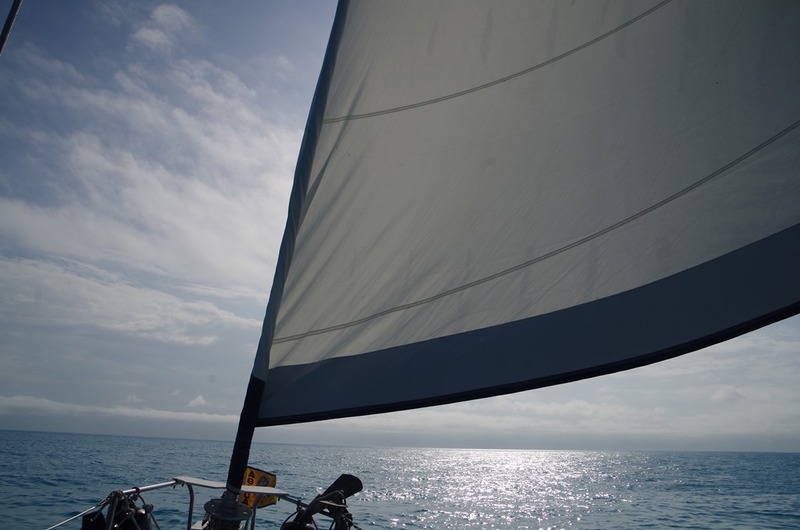 Today we sailed around 38 miles; beam wind, 1st reef. We are anchored near Muddy Point. The water depth is 10 feet at high tide and water temperature is 76 degrees. Our anchor is fully set into sand. It was a bit rolly because we are about 5 miles off shore. And winds are 20 knots but with Shallow water, waves are only a few feet max. Night 4 We anchored south of the Southern tip of Andros in the reef area. No BTC towers within 100 miles. The sky’s look like they will start crying soon. Sure hope it doesn’t get to rough in the rainstorm. 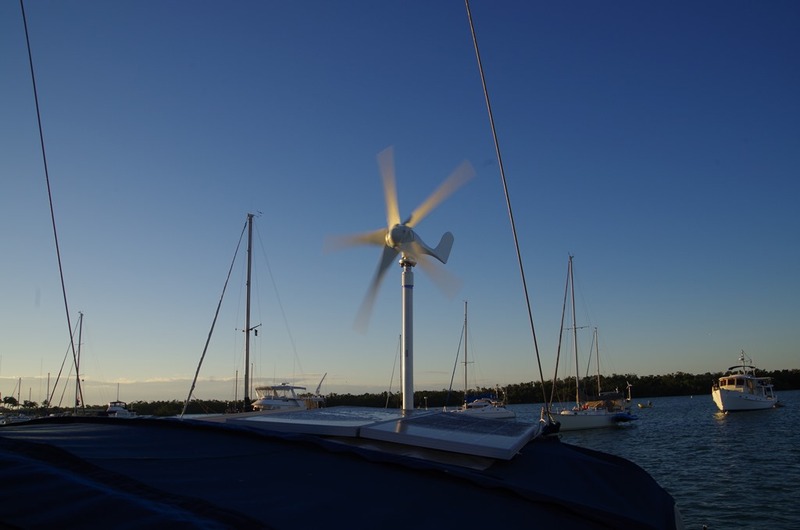 Because we are anchored without much protection, but the winds are expected to be light tonight. Okay, with all that said. It was an uneasy night. We rocked and rolled all night. nearing 6 a.m. we heard a loud bang. Bryce and I ran to the cockpit and checked the Anchor alarm and interments. The Anchor alarm went off. Bryce ran out to the anchor. It was thundering and lighting Holly crap… That is putting it mildly. His face said it all. I cannot believe it… The anchor-line broke off. The bow roller stopped turning and the line wore it down to the bolt. It then frayed and broke. We lost about 60 feet of chain and of course we said good buy to Dan Senior. The weather didn’t permit us to go diving for it. Night 5. Still no internet. You are not going to believe this.. We sailed until around 9:00 p.m. Waves became small; less than one foot because the winds laid down to around 9 mph. Water Temp 78; water depth 26 feet. It was overcast most of the day. Okay, get this.. this morning after leaving our anchorage in the reef, we Bumped into something.. we thought maybe a shipwreck because it was almost on the shipping lane through the reef. Light grounding no issue. Later that day Bryce took Dan Junior up and hooked him up. We also still have Delta as our back-up/sea-weed anchor. On day 5, as we headed to Comers Channel (near George Town), we tagged BTC a cell tower and learned of a miscommunication concerning our where-abouts. 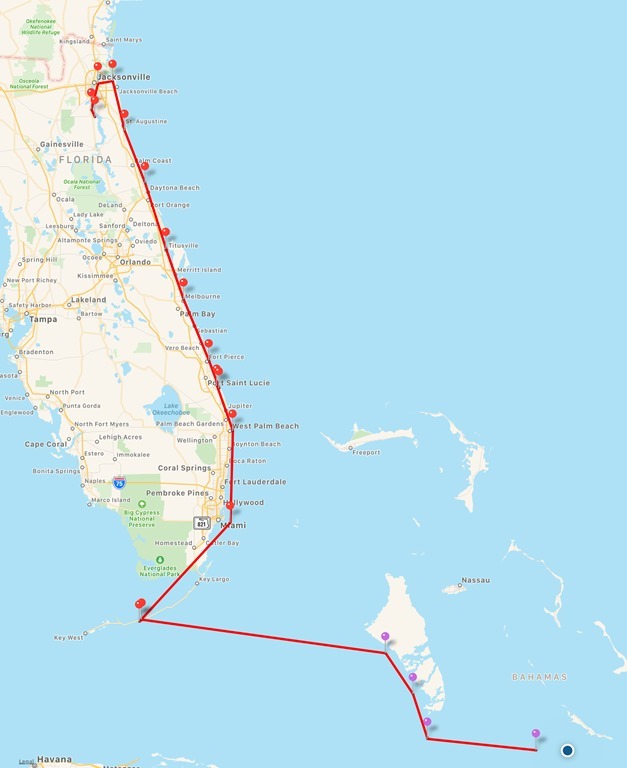 Thanks to Glenn Tuttle in Boot Key harbor for reposting the chart that we posted on Facebook and text messages showing our intended 400 mile route and the number of days we expected to take. 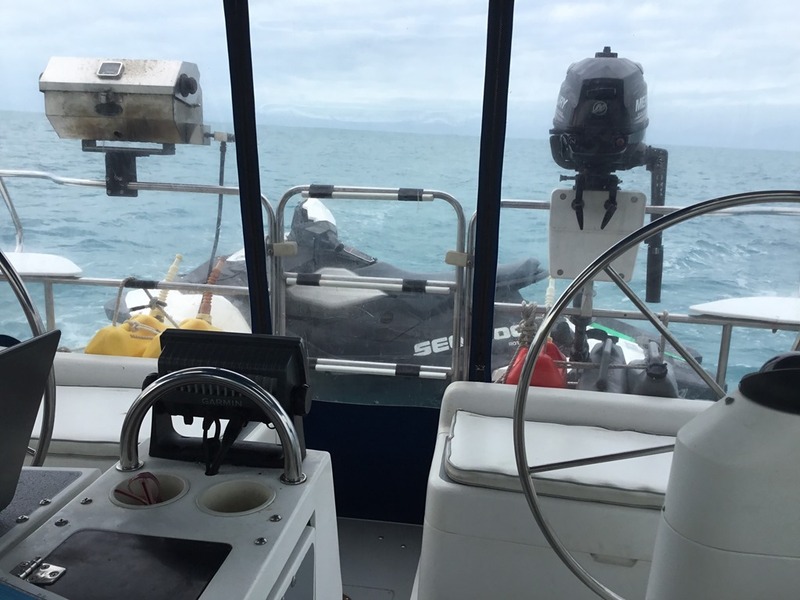 As a side note, we have two PLBs that are registered with the Coast Guard for emergency. Night 6 we drop anchor in George Town at 11 pm. It was a very dark night, no moon, so we came in under instruments. Good to be back in the protection of land again.